Today I wrote a Twitter thread with the intention of talking about the hilarious text descriptions assigned to stock art images. 'Sad pensioner sitting in wheelchair and waiting for his family at nursing home,' reads one inscription. 'Miracle spiritual healing crippled man exalted arms spread at the ocean shoreline as he stands up out of his wheelchair and walks towards the sunrise,' reads another. And then I clicked 'next page'. And froze. There it was. A whole series of Shutterstock images of a man - a non disabled man, as it turns out - in attitudes of despair. Including that one image where he has a gun to his head - another image where he has a gun jammed up under his chin, his finger on the trigger. A series of images of a man in a shirt and jeans. 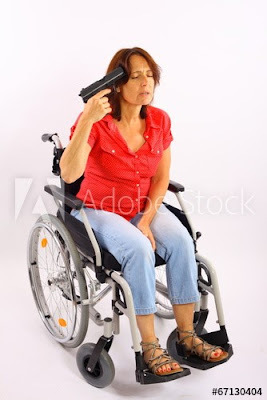 He is using a wheelchair and has a gun pressed to his temple, held to his face or held nearby in various attitudes that depict an intention to suicide by firearm. The description was 'disabled student desperate and committing suicide'. Shutterstock, and other stock image sites, rely on keywords that people search to find images. The keywords are telling. 'Frustrated'. 'Alone'. 'Disabled'. 'Hopeless'. 'Suffering'. 'Suicidal'. Just in case you thought crip suicide was just for students, the same guy reenacts the scenario - dressed in a suit. That model is in a bunch of other images, including one lonely other businessman suicide image. But this time he has other reasons to die, according to the keyword search. They include 'overworked', 'bankrupt', 'fired'. In the other two images, the message is clear. He wants to die because he's disabled. 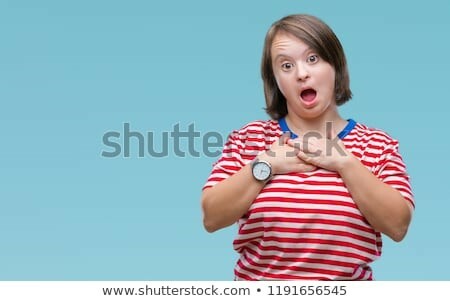 I started to search in earnest and found this image - an image of a young woman with Down syndrome. She had her hands pressed to her chest and looked surprised. I would not have mistaken it for an image that depicted suicidality. The search terms appended to the image were even worse. 'Down syndrome' and 'handicapped' were expected, but not 'strangle', 'suffocate' and 'suicide'. Certainly not 'violence' or 'murder', 'pain' or 'panic'. And most chilling of all in that sea of keywords, the term 'success'. A young woman with Down syndrome. She is looking surprised. Both her hands are pressed to her upper chest. As a disabled woman, I had a physical, visceral reaction. I wanted to vomit. I cried - left the computer for a while before returning to search other stock image sites. They were all the same - in some cases, worse. From Adobe, the stock image site I used up until tonight. I have cancelled my subscription. There are the same image sets of gun-in-mouth man and depressed-paralysed-veteran, but they've taken it one step further - there's an image of a woman with a gun in her mouth. In other images, she has a mop and broom. The search terms include 'weary', 'sad' and 'unemployed', but they also include the term 'proud'. That says something about perceptions of disability and support - don't you think? A woman sitting in a medical model wheelchair. She has a gun pressed to her temple. Her eyes are closed and one hand is in her lap. 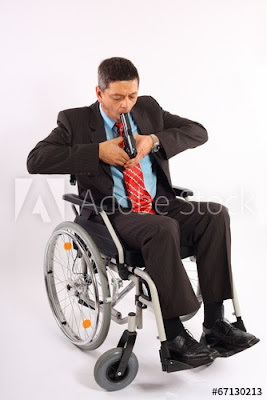 An image of a man in a suit, using a medical model wheelchair. A gun is rammed into his mouth and he has both fingers on the trigger. I wonder what the photographer said to that young woman with Down syndrome when he was asking her to put her hands around her neck, pretend to strangle herself. I wonder what he said to that non disabled woman when he asked her to put that gun in her mouth. I wonder how he would feel about himself if he broke his neck. It's hard to convey the impact of these images - of the sheer volume of them in absence of images that counter their narrative about our lives. These are non disabled people, telling other non disabled people what they think about us, in no uncertain terms. That we're sad, hopeless, doomed to live a miserable existence. That we only exist to inspire non disabled people or invoke a belief in a merciful God. Its easy to feel hopeless in the wake of what seems like a relentless tide of ableism, especially when you're already struggling. And bear no mistake, it IS relentless. 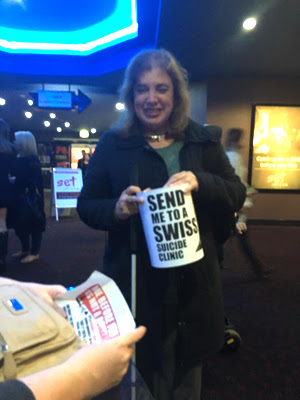 A few years ago, we protested Me Before You, the disability snuff movie that told the world that it was better to be dead than disabled. Not one person said no. Not one person asked me if I was okay. Not one person asked me why I wanted to die. At the end of the night, the tin was a quarter full. Before You protest with a 'suicide tin'. We donated it to a suicide bereavement fund. I cried all the way home. I can't help but think that these two things are connected. That if I had walked up to the people at the movies, they would have asked if I was okay. Given me the number for Lifeline. Had a conversation with me. Offered to buy me a drink. Maybe they all worked in marketing. Maybe they all have a Shutterstock account. 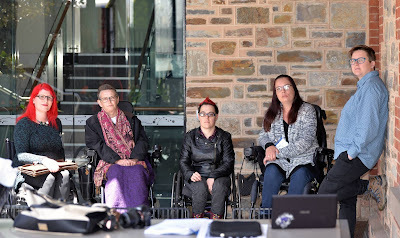 We need to have some critical conversations about the way disabled people are depicted in the media, in advertising, in films and in magazines and on websites. If the majority of people think that our lives are so miserable that we want to suicide - what does that mean when we want to get a job, have a relationship, find a friend? If people think that our lives aren't worth living - why would they fight for our support and our right to live, rather than fighting for our right to die? 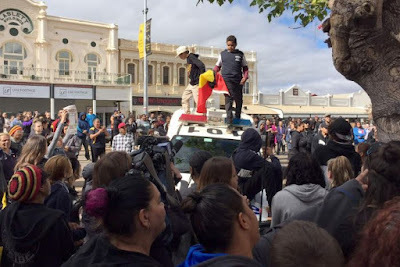 If visual information and algorithms reflect the biases and values of the people who create them - what kind of attitudes are being reinforced in the eyes of the public? One thing is for certain. We have the right to be represented as we live, not in the way that non disabled people think we live. Not in attitudes of pity, charity, tragedy or hopelessness. We have the right to be depicted as real humans who unapologetically take up space in the same world non disabled people do. 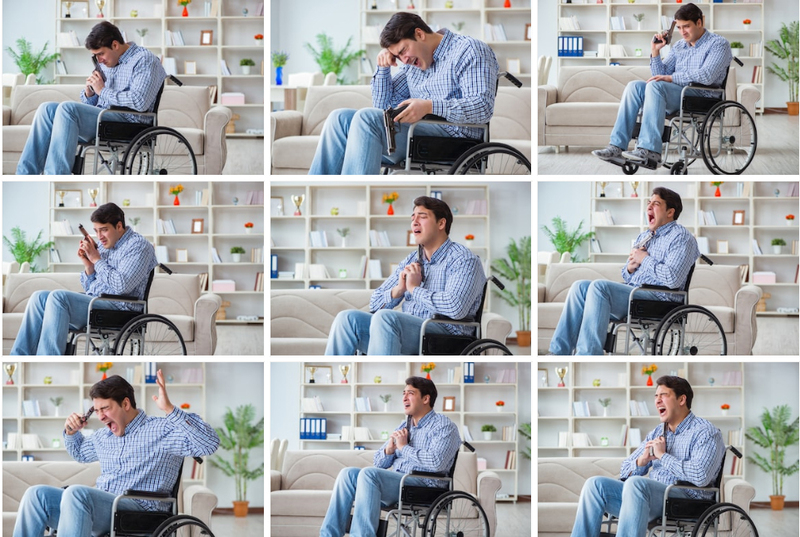 It's time for stock image sites to stop 'cripping up' and time to represent disabled people with equity and humanity.